Unbelievable sustain, drive and dynamic range are all controlled from the guitar and the player. The Hawk is super flexible and works with virtually any amp. 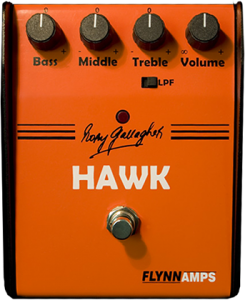 Classic Rory Gallagher guitar tones are best achieved with Tweed Fender amps such as the Bassman, Tweed Twin, Tweed Deluxe, Concert as well as Marshall combos and Vox AC30/ 15 amps but you’ll find most valve amps will work really well with the Hawk booster. In the 1960’s there was one pedal that every British lead guitarist knew they needed…the Dallas Rangemaster. The warm and smooth sounding amps of the period were transformed into guitar tones that are still a vital part of Rock music. 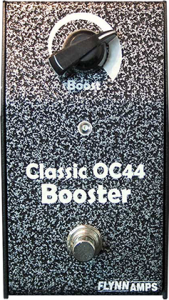 We have faithfully recreated the Rangemaster with our Classic OC44 booster using low noise components and hand tested OC44 Germanium transistors. When it comes to shear sustain and power a vintage fuzz still has no equal but when it comes to time clean up many designs just leave you with a flubby, wooly, tone that doesn’t cut any more. We decided to tackle this problem and have created our new Fuzz Tone. All the magic super sustain when you wind the guitar up and a beautiful clean tight tone when you wind the guitar back. 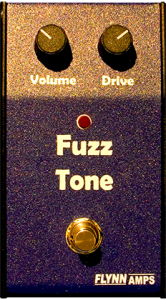 The best fuzz we’ve ever tried, we think you’ll like it. When you need a straight boost that will lift your volume level but won’t colour your tone the Flynn Amps FET booster is the perfect choice. An ultra high impedence FET input section buffers the signal prior to boosting to ensure that detail is retained with the added benefit of adding valve like shimmer to the top frequencies. 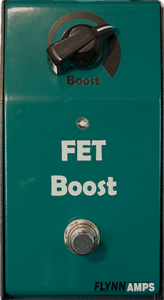 Great as a simple valve amp overdrive thanks to it’s high output level boost the FET will add life to any rig.